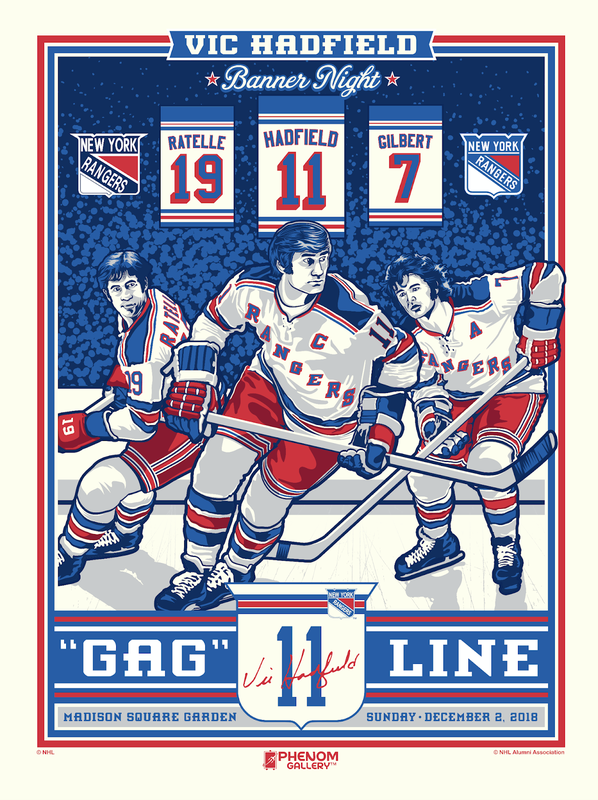 Phenom Gallery continues to its popular line of officially licensed NHL screen prints with a very special poster celebrating last Sunday’s ceremony when the New York Rangers retired Vic Hadfield’s number 11 jersey and hung a banner from the rafters of Madison Square Garden in his honor. To commemorate this amazing achievement, Phenom Gallery has teamed up with artist Stolitron to create a poster showcasing Hadfield along with his partners on the famed Goal-A-Game line, Jean Ratelle and Rod Gilbert. The New York Rangers Vic Hadfield Number Retirement Screen Print by Stolitron and Phenom Gallery measures 18”x24”, comes signed and numbered by the artist, and is limited to just 300 pieces. Fans can purchase this 6 color print exclusively at at the Madison Square Garden Team Store at Chase Square for $60. A very limited run of Printer Proofs of this print are currently available at the Phenom Gallery online store. Limited to just 25 pieces these Printer Proofs retail for $60.